The history of these sites goes back to the twelth century. Legend holds that the youth Galgano was born into a noble and wordly family, until one night the Archangel Michael appeared to him in a dream and converted him to christianity. as a sign of renunciation of his frovolous life, Galgano thrust his sword into a stone, so that he could then worship the hilt as if it were the cross of christ. Galgano subsequently became a cistercian monk, and the hermitage of Montesiepi was built upon the site of the sword in the stone. The chapel was constructed around 1185, on a circular plan with the walls and roof forming a dome . In the adjacent oratory we can admire frescoes by Ambrogio Lorenzetti, in the space of a few years the hermitage acquired such importance that the chapel become too small. As a result, between 1224 and 1228 the great church was built on the area beneath the hill in cistercian gothic style. The abbey of san galgano was extremely powerful between the thirteenth and the fourteenth centuries, but then fell into decline. The church was abandoned and left to the decay, and in 1786 the bell tower collapsed bringing with it much of the roof, leaving the abbey open to the sky. It remains largely unknown what Tuscany has hiding in its innermost depths. The immensely valuable underground heritage that this region contains is rarely spoken about: labyrinths of caves, Etruscan necropolises, mines, tunnels, passages and "buttini" carved into the tufa stone. This is a whole underground world that offers a new and wholly unusual glimpse of Tuscany to those who care to explore it. And who can resist the discreet charm of the underground streams and "treasures" that the beautiful city of Siena holds in its depths? In its subsoil lies an aqueduct, still passable in some places and testament to its high quality and creative engineering, consisting of 25km-long tunnels that run beneath the city's houses and churches, designed to bring water to the medieval fountains and wells. The word "bottino", which denotes the Latin word from around 1200, "buctinus", refers to the fact that, at one time, these tunnels were barrel vaulted. The tunnels were dug at the centre of the two geologic strata that form the terrain for which the Siena area is famous, i.e. the upper, sandy layer that filters the rainwater and the lower, harder clay layer that supports the opening. From here the water would collect in the "gorello" (little channel), with its terracotta tiles, and flow towards the fountains. Many "bottini" near the city continue to function today, bringing water to Siena's fountains, the most important of which is undoubtedly the Fonte Gaia in Piazza del Campo, thought to be one of the greatest sculptures of the 15th century. It's a pity that, in order to visit these "bottini", visitors must contact the City Council months in advance. However, for those who are eager to learn more about them, a new Water Museum (in Italian, the "Museo dell'Acqua") that promises to reveal and explain all the secrets of the Siena's underground waterways has been opened at the site of Siena's Fonte di Pescaia. And yet Tuscany holds even more underground wonders in the form of archaeological parks (such as Montieri, Gavorrano and San Silvestro archaeological park in Campiglia Marittima), many of which can be found in the Grosseto and Livorno area in particular. If, however, you find yourself in or around the Lucca and Garfagnana area, be sure to take an hour to explore Vergemoli's great Wind Cove (Grotta del Vento). Here you can admire thousands of whitecoloured stalactites and stalagmites that will catapult you into a parallel wonderland. Prepared to be amazed. Just over three kilometers from the fortified town of Monteriggioni, this tiny hamlet that in ancient times hosted the pilgrims walking the Via Francigena, stores a rich cultural heritage. Abbadia Isola is named after its raised position as compared to the surrounding marsh land around the Cistercian Abbey of San Salvatore, still now considered the treasure of the hamlet. The abbey is located in the midst of the fortified complex of Abbadia a Isola and it was built as a replacement of an older church structure built before 1001. Today the abbey is shaped like a basilica with a nave and two aisles, roofed with the crypt and closed by a three-apse tribune. The inside is divided in three naves according to the Lombard style typical of the Benedictine abbeys of the Elsa valley. The abbey of Abbadia a Isola keeps its cultural treasure, the impressive central stairway, the baptismal fount of 1419 decorated with figures; the fresco with the Assumption of the Virgin Mary by Vincenzo Tamagni, dated 1520; the recently-restored monumental Pala of San Cirino painted by Sano di Pietro, dating back to 1478, and a marble shrine of the classical Roman art going back to the first century BC. The great painting of the Virgin Mary on the Throne with Child, Cherubs, Angels and Saints, attributed to Taddeo di Bartolo and dating back to the late 14th century, today is located at the Civic and Diocesan Museum of sacred art in Colle di Val d'Elsa. The Crete Senesi look like a choppy sea tinged with red, yellow or emerald green depending on the season. They can also resemble a surreal desert landscape, barren but with brightly-coloured dunes. This is a remarkable landscape, and there is nothing else like it in the world. A place where, no matter what time of the year it is, people are happy to lose themselves in long, enchanted walks, taken at just the right pace. We are south of the city of Siena, in the region that was known as the "Accona Desert" during the Middle Ages. This was because, with the exception of sunflowers, forage and grain, low rainfall meant that nothing grew there. However, despite being the most inhospitable part of the Crete Senesi, the area offers travellers landscapes of rare and intense beauty. The scenery has, for years now, been endlessly replicated on postcards, taking this charming image of authentic Tuscan countryside to the rest of the world. It is an incredible region that owes its special charm to its surreal succession of coves and "biancane": the former are the long furrows that typically form in clay soils while the latter are those white dome formations, rich in salts and sodium, that give the region its barren appearance. It's not magic that makes the Crete Senesi so fascinating and amazing: they are the fruit of nature's wise hands. Surrounded by these landscapes, you would be forgiven for having an overwhelming feeling that you'd been there before - a sort of déjà vu most likely brought on by the popular postcards. hot springs, frescoes, abbeys, churches, monasteries and delicious gourmet products such as Chianina beef and, of course, truffle. In the heart of this very area is San Giovanni d'Asso, renowned the world over for its truffles - considered to be the "white gold" of these barren lands and rightly so. This prestigious, 100% Tuscan product is best served accompanied by an excellent extra virgin olive oil or one of the exquisite pecorino cheeses (made from sheep's milk) that are produced locally and according to ancient sheep farming traditions. Autumn is undoubtedly the best season to experience the flavours of Crete Senesi. November in particular is the month in which the "Crete d'Autunno" ("Autumn in Crete Senesi") and the "Mostra Mercato del Tartufo Bianco" ("White Truffle Festival") events take place, making it the perfect time to find wonderful food and to discover the good-looking and great-tasting produce of this region. A visit to Buonconvento is highly recommended but would not be complete without stopping off at the excellent Museo della Mezzadria (Museum of Sharecropping), where all the secrets of rural Tuscany have been reconstructed. Situated in the heart of the Crete Senesi, near Asciano, sits one of the area's finest treasures: the Abbey of Monte Oliveto Maggiore. Surrounded by cypresses, oaks and pine trees and perched on a hill that dominates the surrounding landscape, the Abbey can only be described as one of the finest examples of 14th Century religious art, a place where the magic of mystical hermitage can still be strongly felt. Founded by Saint Bernardo Tolomei, a community of retired Benedictine monks continues to live in this monastery. The atmosphere of this sacred space overwhelms visitors who come here from all over the world to admire the architecture and the numerous works of art that are housed here, from the stunning frescoes by Signorelli and Sodoma to Della Robbia's terracotta creations. All this and much, much more confirm that the Crete Senesi are one ofItaly's must-see places; an area to discover step by step. Montalcino is an ancient medieval village in the hills of the Val d'Orcia, approximately 600 metres above sea level; an enchanting environment that was recognised in 2004 as a UNESCO World Heritage Site. The municipality covers 243 km2, one of the largest in central Italy, and has a unique landscape with dense forestation dotted with plains with the traditional cultivation of vines and olive trees. The origins of the town predate the year 1000, when the nearby Abbazia di Sant'Antimo was one of the most powerful monasteries in Tuscany. The increase in population led to significant development and, in 1361, after a series of events, the inhabitants of Montalcino became citizens of the powerful Siena, which fortified the town, strengthening the walls and building the stronghold. Montalcino was raised to the status of "city" and diocese in 1462 by Enea Silvio Piccolomini, who ascended to the papal throne as Pius II. The first thing that you notice as you reach the town is the striking castle, which is still intact. The structure has a pentagonal plan with towers at all the corners and a complete circular walkway. The entire town is dominated by the walls, which give lovely views as far as the eye can see. Building work on the castle got under way in 1361 on top of the old thirteenth-century town walls, incorporating the lookout tower of S.Martino, the keep of S.Giovanni and an ancient basilica. The mighty Medici rampart extends to the south, added by Cosimo in the mid-sixteenth century. We recommend that you pay a visit to the town museums of Montalcino, which are located in the rooms of the Convento di Sant'Agostino and offer a vast and interesting archaeological, medieval and modern collection. Amongst the many churches there's the neoclassical cathedral of San Salvatore and the sanctuary of Madonna del Soccorso and S. Egidio - the "de' senesi" church. Dedicated to the town's patron saint, this church is situated in one of the area's most scenic points, a perfect balcony overlooking the Tuscan countryside. The town hall (late 13th century) is also interesting; it's a solid building with a very tall bell tower with the Campanone, which still strikes the hour of the life of the town today. Nine kilometres from the town centre, heading towards Castelnuovo dell'Abate, we recommend a visit to the solitary Abbazia di S. Antimo, one of the highest specimens of the French Romanesque in Italy. Connoisseurs will find food for thought in Montalcino, or "pane per i loro denti" as the saying goes in Tuscany. The town is especially admired for its prized wines, Brunello in particular, as well as for its honey, extra-virgin olive oil, typical cured meats and cheeses, which can be tasted in the characteristic restaurants and wine bars or at the popular food festivals. Three days will concentrate on honey in the first weekend in September in the fortress; whereas on the last Sunday in October, there's the Thrush Food Festival to relive the local culture with its culinary traditions and recipes. It's difficult to find an area that protectively guards, as if it were in a treasure chest, such a vibrant and lively history like in Val d'Elsa in another part of Italy. It's not just down to its well-preserved architecture of the past, which can be seen in at least three spectacular places such as San Gimignano, Monteriggioni and Colle Val d'Elsa, but history in this wonderful area of the province of Siena has never depended upon the past, given that it is a lively book; you can flick through the pages, talking with individuals or letting yourself be intoxicated by the perfumes or enchanted by the scenery. Here, history is simply what it should be: to understand the reason to get to know and appreciate the present and the future. But the Val d'Elsa stands for much more than just the magic of the three towns we mentioned, which are universally known; it is best discovered in less extraordinary places, which are perhaps more "complete" for this very reason, such as Casole and Radicandoli, with their town walls, hubbub, Roman villas and the slow rhythm of the past and, why not? in Poggibonsi. History has always played hide and seek in this town and it has seen big steps forward in terms of progress despite being rooted in the oldest and most complicated events, and often fleeting beauty, and recollections relate more to modernity than oldness. It is a land to be loved that is full of surprises, also including that extraordinary turreted vision described by Dante Alighieri in the astonished and impressed Canto XXXI of The Divine Comedy, hence the stuff of legends, "As with circling round Of turrets, Montereggion crowns his walls; E'en thus the shore, encompassing the abyss, Was turreted with giants, half their length Uprearing, horrible, whom Jove from heaven Yet threatens, when his muttering thunder rolls." Towers as the dominant architectural element, which alternate with cypress trees, vineyards and olive trees, sketch a landscape also created in harmony with man. From San Gimignano, the town with the towers (there were once 72) to Casole d'Elsa, where the towers of Rocca and Monteguidi stand tall, and the turreted homes of Poggibonsi and Castello di Badia before ending up in Monteriggioni, which is the loveliest example of town walls still untouched in Italy. Built between 1212 and 1219, they represent the (failed) attempt of Sienese fortification to control the Via Francigena and therefore counteract the Florentine expansion. This is what the Val d'Elsa is all about. Memories of the battles, the blasts of the armies, one against the other, the historic blows upon the cobbled streets, life and death, the defeats and rebirths, etc. Arezzo stands on a hill near the meeting of three valleys of the Arno, Casentino and Chiana. It was already a flourishing town in Etruscan and then in Roman times, above all for its manufacture and trade of "terra sigillata" (a special local pottery with a coral coloured glaze). Arezzo is a city of art, but this is not all: it is also the centre of a series of important craft activities (like its famous goldsmithery), and has always been a fertile agricultural area. A free city since 1098, Ghibelline Arezzo had great influence and power over the castles in the surrounding districts; it was routed by the Florentines in the battle of Campaldino in 1289, and then raised to new splendour under the Seigniory of Bishop Tarlati. The most significant buildings to adorn the city date back to this new "golden age": the Church of San Francesco, the Cathedral, a majestic Gothic construction that dominates the city, and the Fortress. On Tarlati's death in 1384, the city fell rapidly into decline, until its definite loss of freedom and independence in 1384, when it was sold to Florence for 40.000 gold florins. However it continued to be embellished and provided with important monuments under Medici rule. Visitors who really want to get to know this city well must walk through its suggestive old centre, admire its palaces, churches and the museums bursting with works of art. The archaeological museum possesses an extremely rich collection of splendid coralline vases, the first household pottery that replaced the gold and silver crockery on the tables of the Romans. The Church of San Francesco boasts the most famous walls in the world, decorated with the Legend of the Cross frescoed by Piero della Francesca, the greatest painter of the early Italian Renaissance. Montepulciano, immersed amongst wonderful vineyards, welcomes us with its magical atmosphere that is full of art, culture and history. The town, which is Etruscan in origin, is situated on the crossroads of two important transport links, from Chiusi to Arezzo, from south to north, and from the Valdorcia to the Valdichiana and Lake Trasimeno, from east to west. This strategic location on the border of the area of influence of various medieval potentates, such as Orvieto, Perugia, Siena and Florence, allowed it to maintain a certain autonomy, pledging its allegiance to the major cities in perennial conflict amongst themselves. After 1511, Montepulciano fell to Florence and continued to follow the ups and downs of history until the Unification of Italy. The city stands on a ridge. The Corso Centrale, a one and a half kilometre climb, goes from Porta al Prato to Piazza Grande with a difference in height of about fifty metres. Our tour begins in the car park of Piazza Don Minzoni, right in front of the tourist information office, where there's lots of info and a useful map of the town. Straight away we visit the nearby church of Sant'Agnese, the town's patron saint, and then we pass through the town walls at Porta al Prato. We start to climb up along the Corso, the heart of the sixteenth-century town, and we're suddenly in an outdoor museum. There's one striking building after another, including the outstanding Palazzo Bucelli, which has slabs with Etruscan and Latin inscriptions on the base, as well as funerary urns. In 1781, many of the local findings were in fact purchased for the grand-ducal galleries and various stones were set at the base of this sixteenth-century building, which is still a testimony of Montepulciano: tracing the course of history the urban layout with archaeological material. Furtheron, we find the church of Sant'Agostino, designed by Michelozzo, with humanistic and Late Gothic elements. Opposite, there's the unusual Torre di Pulcinella with the famous Neapolitan mask that tells the time. We go past Piazza delle Erbe, the economic centre of the sixteenth-century town, with the Logge del Grano attributed to Ippolito Scalza. At the top of the Corso, at a slight incline, we find Piazza Grande, laid out towards the end of the fifteenth century by Michelozzo. The main monuments of Montepulciano stand in the square. The cathedral, town hall, Palazzo del Capitano del Popolo and the extraordinary Pozzo dei Grifi e dei Leoni, regarded as one of the most beautiful wells in Italy. We look around us and breathe in a magical atmosphere suspended in time. It's no coincidence that many scenes of the film New Moon (from the Twilight saga) were filmed right here. The cathedral is incredibly simple. Its monumental size is mostly entrusted to the play of lines and shapes, with great sobriety inside, which is practically bare. The town hall, with its central tower and crenellated crown, recalls the lines of Palazzo della Signoria in Florence. It was built by Michelozzo between the end of the fourteenth century and the first half of the fifteenth century. Palazzo dei Nobili Tarugi is attributed to Antonio da Sangallo the Elder. Next door there's Palazzo del Capitano del Popolo with its Gothic plan; opposite, we find the Pozzo dei Grifi e dei Leoni. There's a place we just have to stop at along our tour, which has everything to do with food and wine. We head back down through the Talosa cellars, carved into the rock and tufa, where at last we can enjoy another local delicacy, the Nobile di Montepulciano wine, an important DOCG product that's famous worldwide. Along the Corso that passes through its historic centre, opposite the church of Sant'Agostino, you'll find the Torre di Pulcinella, which probably dates back to the mid sixteenth century. On its summit, a statue of Pulcinella appears as if by surprise, connected to a clock mechanism below, which moves the arm of the famous Neapolitan mask every hour, thus marking time on the bell. But how did Pulcinella come to Montepulciano? We don't really know how things went. Legend has it that it was a Neapolitan priest who wanted the statue of Pulcinella at the beginning of the seventeenth century, replacing, it seems, a previous sculpture that embodied Mangia, the famous custodian and bell ringer of the Sienese tower of the same name. However, all traces of the first and original Pulcinella have been lost. The current statue, in wood and metal plate, in fact dates back to the early eighteenth century. Heading towards Dudda in the Chianti hills, coming from the Via Chiantigiana, stands Cintoia, with its former castle, once a Longobard guard tower and later a Guelph defensive structure, of which a small quarter remains. The place has a long and tormented history. In 1260 the castle suffered a fire, in 1356 it was besieged and sacked, and eight years later, it managed to resist the assault of the Pisans for a long time. Besides, the place name itself refers to an ancient origin; perhaps Roman since "cintoia" refers to the land surface of a "centuria", which corresponds to 200 jugera, that is approximately 50 hectares when converted from the Roman units of measurement. Another hypothesis is that Cintoia refers to the Longobard origin of "centena", a rural administrative repartition of the Early Middle Ages. Nowadays practically nothing remains of the castle, but the surrounding settlement lets us catch a glimpse of archivolts, doors, windows and masonry of the time. Amongst these, carved into a wall, a Jerusalem cross stands out, thereby proving the existence of a shelter for wayfarers. Today, Cintoia is famous most of all for the mineral water spring, situated at approximately 600 metres above sea level and surrounded by a vast and pristine wooded area. This wooded landscape is practically untouched and dominated by the splendid villa that belonged to the local Del Vernaccia family since ancient times before moving to Florence in the fourteenth century to work as merchants. The villa was built, according to the trend at the time, in 1708 by Piero Antonino Del Vernaccia, son of the senator Piero Ugolino and Laura, daughter of Piero Capponi. He was also the one who built the chapel dedicated to San Antonino, who spent a long time in Cintoia in the fifteenth century. Nowadays the villa preserves its virtually unaltered eighteenth-century appearance, both outside with the facade with its elegant windows decorated with small volutes; in the middle there is a striking staircase with two flights of stairs, which leads straight to the first floor. Inside the halls, we can still see the large fireplaces in pietra serena and the stucco works and frescoes on the walls and ceilings. Given that this area belonged to the Florentine county, the municipality reported to the Republic of Florence and when the republic decided to give these municipalities administrative autonomy in around 1250, it grouped them together into leagues and chose Cintoia as its headquarters. The league of Cintoia lasted for many centuries and was only abolished in 1773 by the grand duke Pietro Leopoldo. Having lost its municipality and strategic importance at that time, Cintoia became a small, hidden village on the border between Chianti and the Valdarno. Its little more than 200 inhabitants continued to cultivate the land amongst vineyards, woods and olive groves. Its isolation over time and history has done the place good, making Cintoia a wonderful, unique and lovely village. 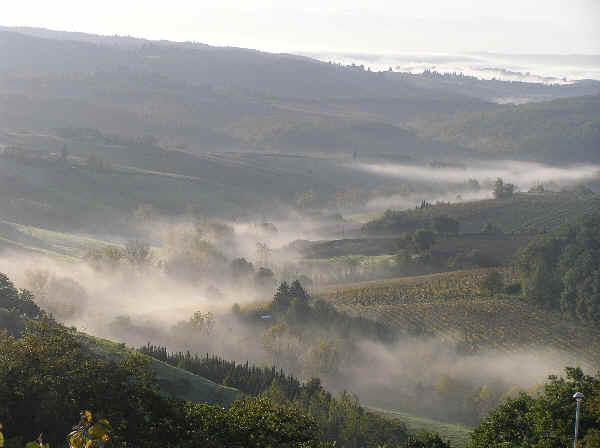 It is one of the most magical and loveliest places in Chianti. It's one of those villages where life seems to have been frozen in time many centuries ago. Its foundation, development and power comes from its geographical location along the important road that connected Florence and Siena in the Middle Ages, a road that also passed through the Val d'Elsa at the time. Having passed San Casciano, this important ancient highway that connected the city of the fleurde-lis with the Via Francigena forked, thereby creating two distinct roads that both led to Siena and were both called Via Romana. On the road that wound along the ridge of the hills dividing the Val di Pesa from the Val d'Elsa stood the "castello of San Donato "De Pocis", which due to its situation along the important road soon became, after Barberino, the main settlement of the League of Barberino Val d'Elsa, so much so that in the thirteenth and fourteenth centuries it headed up one of the Terzieri (a type of governing area) into which the latter was sub-divided. San Donato in Poggio has preserved its typical urban layout of a walled medieval town. It is a settlement on high ground, surrounded by thirteenth-century walls dotted with towers, with an homogeneous town centre in which stone dominates. It is divided in two by a main road that connects the two gates to the town. Losing your bearings within these high defensive walls is a truly unique experience. It's just like catching a glimpse of fragments of medieval life at every corner. In addition to the tall tower that must have acted as a keep, take a look at the different medieval civil buildings, superbly preserved, with numerous decorative and technical elements such as archivaults, architraves and wall coatings that all date back to at least the thirteenth century. In the main square of the castle, there's the Renaissance Palazzo Ticci, later Malaspina, now rebuilt after the damage caused during World War II, the elegant hexagonal well with the public tank below, rebuilt in 1867, which in the past was San Donatòs only water reserve, and the Gothic church of the castle dedicated to Santa Maria della Neve. However, the town's most important element stands outside the fortifications, outside Porta Senese, which also gave its name to the town, that is the Romanesque church known since 989 with the name "in loco pocie". "Pocie" and later "poci" was the name of the ancient settlement that stood here, perhaps in Roman times, which was later turned into "poggio" (meaning "knoll") due to the place's geographical properties. The church alone, one of the oldest and most intact not only in Chianti, but in the whole of Tuscany, is worth a visit to San Donato. Entirely in Tuscan Romanesque style, it has a nave and two aisles ending in three semi-circular apses and embellished with a striking bell tower. It houses works of extraordinary beauty such as a wooden cross on a panel, a baptismal font in glazed terracotta (1513) by Giovanni della Robbia and a marble holy water stoup. Chianti, the heart of Tuscany, famous all around the world for its hills bursting with vines and olives and for its superb wine and oil making, also offers a rich natural and historic heritage in its highest parts. Mountainous Chianti extends in particular from the municipality of Gaiole in Chianti towards Arezzo and features forests, vast meadows and numerous artistic and historic findings, still housed in small villages such as Nusenna and old monasteries including Badia a Coltibuono, Badia a Montemuro, Badia a Ruoti and Badia di San Salvatore alla Berardenga. Monte San Michele is Chianti's highest peak at 892 metres, offering a rich variety of animal and plant species. The major tourist attraction in the whole area is the Vallombrosan monastery of Badia a Coltibuono, which takes its name from one of two mountain passes, as well as Sugame, at 800 metres above sea level. The monastery of Badia a Coltibuono, also known as Abbazia del Buon Raccolto (the monastery of the good harvest), was established in 1051 and belonged to the Vallombrosan Benedictine monks until 1810. Its most flourishing period of development was in the fifteenth century, under Lorenzo de' Medici, prior to being transformed into a farm and villa and taking on the role of a strict agricultural guard, which is still preserved today, given that it is home to an established agricultural firm. The mountain area of Chianti still preserves important relics of the long conflict between Siena and Florence, from the Castello di Monte Luco to Monte Calvo, passing by the stronghold of Montegrossi, which towers over the Chianti Classico and Valdarno area. Visiting these places takes you back in time and lets you discover a less famous area of the Chianti region that is still intact and full of nature perhaps for this very reason. They are called World Heritage Sites and are places that comply with particular characteristics sanctioned by UNESCO with a certification of beauty, culture and uniqueness natural conservation and preservation of cultural works. Something so extraordinary that only 890 places have been recognised as World Heritage Sites around the world. Italy has the lion's share with 45 World Heritage Sites and Tuscany boasts six of them, four of which belong to the province of Siena. An extraordinary fact that says a lot about the beauty of the lands of Siena given that there are 10 strict selection criteria to become a UNESCO site, meaning that it's not an easy feat, so let's go and discover these gems one by one. The historic centre of Pienza. A town dreamt up, desired and built by Enea Silvio Piccolomini, who became Pope with the name of Pius II and who wanted to transform his birthplace into an ideal Renaissance town. It's a wonderful place in terms of its well-balanced and lovely architectural equilibrium that UNESCO decided to award since it represents the first humanistic application of urban planning and the development of the concept of an ideal town, playing a significant role in the later urban developments in Italy. Pienza, and in particular the group of buildings around the central square, are a masterpiece of creative human genius. The historic centre of San Gimignano. The town of the stunning towers, also famous as the Manhattan of the Middle Ages, is a masterpiece of creative human genius. This is the characteristic that makes it unique for UNESCO to the point of making it also be "a testimony of a cultural tradition and civilisation, as well as an exceptional example of an architectural and scenic complex, bearing witness to important stages in human history." Even though there are now only thirteen towers still standing, the charm and thirteenth-century appearance that emanates from its buildings, great works of art, and the fact that it's superbly located on a hill amidst green and lovely hills lend it a unique magic. The historic centre of Siena. It is registered by UNESCO for being "an extraordinary medieval city. A masterpiece of devotion and invention in which the buildings were designed to be adapted to the entire urban layout and, moreover, to form a unity with the surrounding cultural landscape". Siena therefore as a gem that developed along the Via Francigena, flourishing in art, trade and business, turning it into a cultured city and admired worldwide for its elegant Gothic beauty, numerous museums and the seventeen neighbourhoods, all enthusiastic about the Palio. Val d'Orcia. A unique marriage of art and scenery consisting of unique hills, admired and celebrated in thousands of paintings and postcards, hills that vary from gentle to harsh carved by nature and by the hand of man in which little gems are nestled, extraordinary places like Pienza, Montalcino, Sant'Antimo and Bagno Vignoni to name a few. For UNESCO it is "an exceptional example of how the natural landscape was redesigned in the Renaissance period to reflect the ideals of good governance and to create a pleasing aesthetic appearance. A landscape celebrated by the painters of the Sienese school with the valley depicted with the people who love in harmony with nature. These icons of the Renaissance deeply influenced the way of thinking about the landscape in later years." It is a crucible of unique and extraordinary beauty, where life has flowed calmly through millennia and where it has all remained intact. Four wonderful splendours of the lands of Siena, named by UNESCO as jewels of world heritage, a world force that we just have to highlight. Silence, perfect beauty and dark shadowy cypress trees are the first things the traveller sees on his approach to the majestic Abbey or Badia a Passignano, which watches over, among other things, the mortal remains of St. Giovanni Gualberto, the founder of the Benedictine order. During its thousand years of history, the abbey has lived throughan incredible succession of events. Destroyed by the Florentines in 1255, it was gradually rebuilt from 1266 onwards and completely restructured in the XV century, only to be badly tampered with towards the end of the last century; today it is possible to identify, almost at first glance, the many architectural elements dating from the various periods that have marked Passignanòs past. There is little doubt that the Monastery's darkest hours were after the Napoleonic suppression in 1810, when it was stripped of many of its priceless masterpieces. The silent guardian of the history of the Chianti and Italy, Passignanòs enormous archives have as yet to be completely explored; in fact they contain documents that could shed light on much of the history of the Chianti. In spite of the terrible Napoleonic period, the artistic patrimony contained in the Abbey is fortunately still considerable. The frescoes preserved inside the church are particularly beautiful, especially those in the chapel of Giovanni Gualberto by Alessandro Allori, whose decisive brush-strokes and disquieting colours in his fresco portraying a large group of monks and abbots, together with another of simple country people, gives us a faithful idea of the style of painting in the second half of the XVI century. The frescoes carried out by Benedetto Veli, a minor artist, are also interesting, showing God the Father surrounded by a choir of rejoicing angels. Domenico Ghirlandaio, later destined to attain great fame, also worked here as a young man, in fact he was only twenty-seven when he carried out the magnificent Last Supper in the Refectory, still rather static in style but containing many elements of notable symbolic and figurative effect. The finest architectural elements are without doubt the fourteenth century cloister and the even older bell-tower. The Cloister of Passignano, with its columns topped by depressed round-headed arches, is a typical example of a fifteenth century Florentine cloister. An external view of the abbey shows it enclosed and almost protected by its high cypress trees, while its many towers and battlements lend further harmony to the overall effect. The garden, with its "maize" of bushes, is quite beautiful and gives on to a wonderful view over the long straight rows of vineyards in the fields around it. Badia a Passignano, the thousand year-old guardian of the history of the Chianti, is therefore ready to welcome all visitors, with its silence, its peace and its spiritual asceticism. The town hall was built in the last decade of the thirteenth century; the first meeting of the council was held on the 23rd December 1288. Before then, the Podestà's council had no fixed meeting place and either met in the choir of the parish church or in Palazzo dei Paltroncini in Piazza della Cisterna. The so-called Palazzo Antico del Podestà, located in Piazza del Duomo, opposite the Collegiate church, instead, belonged to the Mantellini family that rented it out as the residence of the Podestà it was purchased by the town council in 1320 in order to use it as accommodation for the guests of the council. The palace was then turned into a theatre and the 51 metre adjoining tower, called La Rognosa, formerly a prison, was given a clock in 1407. Ten year after the actual town hall in Piazza del Duomo, adjoining the Collegiate church, was built, it was given a tower, Torre Grossa, about 54 metres high, which was completed in 1311. The building was enlarged in 1323. The palace, erroneously attributed to Arnolfo Di Cambio, has a four storey structure with windows featuring lowered arches; the façade once featured the Marzocco, the coat-of-arms of the city of Florence, with a lying lion holding a shield in its right-hand paw with the fleur-de-lis, a symbol of the submission of San Gimignano to the Florence. To the right of the palace is a gallery called Arringo, where the Podestà used to swear his loyalty to the people, while the large portico on the left was used for public ceremonies. The actual battlements of the palace are not original but were added in 1881. The building currently houses the Town Museum featuring paintings of the Sienese and Florentine schools dating back to the thirteenth, fourteenth and fifteenth centuries; the most famous painters whose works are displayed here are Niccolò Tegliacci, Taddeo di Bartolo, Benozzo Gozzoli, Domenico Michelino, Pinturicchio and Filippo Lippi. On the walls of the building there are also frescoes depicting scenes of family life by Memmo di Filippuccio and a "Majesty" by Lippo Memmi. In 1323, the palace was enlarged and the courtyard was also built; the well in the centre, dating back to 1361, was built by Podestà Iacopo di Carroccio Alberti; the courtyard is frescoed with scenes representing the administration of justice or religious subjects such as the Madonna with Child with St Gimignano and St Gregorio; the work dates back to the fourteenth century and is attributed by some to Taddeo di Bartolo.